Once anyone has couponed for six months or more, you usually find you have a healthy stockpile of items. Recently, I approached my friend Esther about the idea of a Stockpile Swap. We decided on a date, time and location and began to organize this unique event! We planned our swap on a weeknight, when most people were available. We used many different venues to advertise for the event, such as Facebook, Esther’s blog, and our church newsletter. Each person was asked to bring ten new, unopened grocery, cleaning or toiletry items. We made these terms very clear. We also asked each participant to check expiration dates and double-check that the items had never been opened or used. Many people brought more than ten items, which just made the selection better. Some people even brought candles, books — all new! I was fearful that we would have many of the same items — mostly highly processed food or way too many Johnson’s Buddies soaps or feminine products. But, I was pleasantly surprised to see such a wide variety of items, and even some organic items. One friend even brought some local honey she had on hand! We gave each person a name tag with one of four different colors. These colors were used to divide into four smaller groups. Then we established an “order of play”. For example, it went in a rotating cycle of pink, purple, orange, yellow. As a color group would go to the tables, each person could select only one item. We rotated through the same four groups until everyone had accumulated ten items. We then donated the remainder of the items to local needy families. It was really encouraging to see people go home with ten new items — things they hand-picked and really could use! We also had a coffee table full of coupons that were free for the taking and door prizes to give away. It was a great night for everyone and something I hope to do every six months or so. It helped me to clear out my own stockpile and select some items that I could use. I left feeling like I’d just scored the deal of the year — for free! Amy lives just north of Orlando, Florida. She is a part-time nurse and full-time wife and mother. She loves to host parties, sew, and spend time with her family. She blogs about her sewing projects and home remodel at Gabriel’s Good Tidings. This is an excellent idea, thanks for the post. Definitely going to host soemthing similar. I love this idea! So unique! Thanks this is a grea idea, would love to do something like this. Sounds like fun. Are there any couponers around Edmond/ Guthrie OK area interested? @Dena W., I just read this and I live in South OKC area. My blog is Coupon Closet. I am thinking about hosting one after the holidays! I love this idea! That is a great idea! I have also used extra stockpile items as door prizes at a monthly moms meeting. People love getting free stuff! Awesome idea! wishing I had more couponing friends or church people who could do this! We have been doing something similar for Christmas for the past 2 years with the family. Since my mother and 3 sisters and I all coupon and acquire stockpiles, we decided instead of exchanging gifts with the adults, we would offer up 10-20 things we have stockpiled instead. Each person brings whatever they want to exchange and we put it all in box and take turns grabbing whatever we want or need until the box is empty. Sometimes there is duplications, but it is a great way to go home with something you need without spending any extra money. What a great alternative to Tupperware and Pampered Chef type parties! We have quite a group of couponers at my church, so this might a great option for us!! Hmm, I need to find me some stockpiling friends. @Amanda, Ha, ha. Me too. This is a great idea though. I’m cleaning out our stockpile to donate to the kids’ schools (they do a canned food drive for a local food pantry this time of year) but this is a really great idea. I also liked the idea in the comments about a gift exchange. @andrea, I agree that this a great idea, but I dont know many other stockpilers. 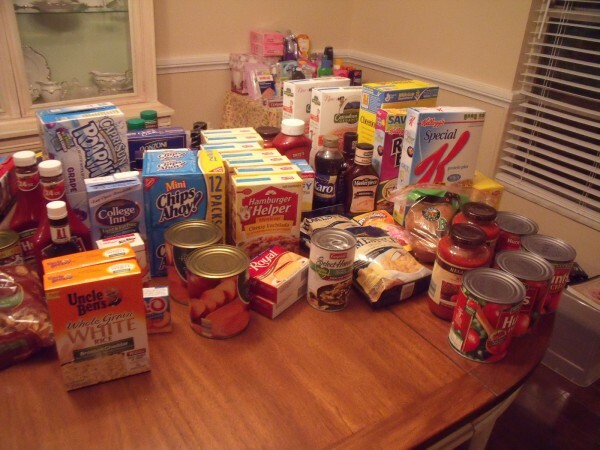 I am also donating a lot of food to my daughter’s food drive. Most of the kids have brought in a few cans. They are amazed my daughter is just a few cans shy of 50 and keeps bringing more in. The class that brings in the most wins an extra gym class. She doesn’t want the prize LOL!, but wants to help others. Those kids probably think we are giving away all of our food. It was so much fun! I loved going home with different things… It felt like free shopping! I love this and wish I had friends that did this…but the comment of its better than a pampered chef made me think.. I may not know a bunch of people, but my friends have friends, and they have friends and etc… If the word was spread well enough, we could have a great time doing it….Any one live in or in the surrounding areas of Wichita, ks? This is such a great idea!!! Anyone in the Phoenix area hosting such a party?? I used a lot of my extras for Operation Christmas Child boxes, but I still have plenty of other new overstkck items. Thanks for the idea. my friend and I also used a lot of the free stuff we get through out the year for the Christmas shoe box operation. This year she packed over 160 boxes! @Krista Miller, Krista, I’m in SCV here in So Cal and would sure be interested. @Kate, Thats alittle to far away for me, Im closer to the O.C. border whittier/la habra area. But thank you for responding Im sure as more people read this we’ll be able to find some new friends! My zipcode is 90605. Anyone within Id say a 10-15 mile radius of me would be convenient. I love this idea! I wish I new some super couponers and stockpilers in my area! What a great idea!!! My Grandma and Mom coupon, but not like I do. They always give me their leftover coupon inserts after taking just a few out. In exchange I often give them items I get free or cheap. Like when Target had better than free face was a few months back after rebate, I gave them each a few bottles of wash which they loved. What a great idea. I wish I knew people that I could swap with. This sounds like so much fun! I think I will have one of these parties after Christmas. What an awesome idea! Love it! We recently did a coupon class at our church and I have several friends that stockpile as well. Thanks for sharing! anyone in Edmond, OK interested in this? I am in edmond and there was someone above in the comments from edmond/guthrie. Would love to get to know other couponers here! LOVE this idea and will be talking to my buds about this for January! What a great idea! With some snacks and chat time, it would be a nice evening for hanging out with the girls! Love this idea – it sounds like fun! Same here Courtney. But this just gave me a great idea! There are many times that I have a coupon to get something free but don’t cause I don’t use it that item. But……if I were to get it anyway then I will have stuff for a swap party. It just sounds like too much fun and who knows someone there might have stuff you need. Courtney – I always get it if it is free or can make money. Donate it to your local food pantry or homeless ministry! I have had thoughts about doing something like this, but wasn’t quite sure how to put it together. Thanks for the details! It sounds like it would be so much fun and I could probably host it at our local library. This is such a great idea! I’d love to do something similar…anyone couponing in the MD/metroDC area?? I just moved to SW Orlando and would love to do something like this. Like another reader mentioned it is also a great way to meet fellow couponers/stockpilers! @Maria, We’ll probably do this for the Orlando area twice a year. Contact me or my friend Esther (both our blogs mentioned in the post) for details! I live in Longwood, which would be a drive from SW orlando, but it would be fun to meet you and have you meet other couponers! Sounds like a great idea for my MOPS group! It is so refreshing to hear about everyone being so generous. I have quite a stockpile too. With 2 kids in college and 2 in high school we do use a lot of the items. What I love is that when the kids need something for themselves or to take to 4-H or church for a service project it is as easy as opening Mama’s box. No last minute trips to the store to get stuff. This is an awesome idea and I’m going to try and get a group of my gals together and do this!! One of my friends had a question I dind’t know how to answer. What if someone brought a more expensive item, is there a price restriction on the items they bring? I guess that would have to be up to the organizizer of the party, huh? Any ideas on this?